the leaves are falling everywhere...that means it's FALL! (sorry, Yo Gabba Gabba gets stuck in my head 24/7). Ahh it's October. It's cooled off a bit and there are a lot of "boo's" out there. In the beginning of October Noah hated ALL THINGS HALLOWEEN. Seriously, Clint scarred him for life at Lowes (see a few posts back). A few weekends ago we went to Red Bluff Farms in Folsom, LA with Clint's mom and sister. It was fun, they had animals and a few pumpkins. We took a hayride it was cute. After that we headed to the farmers market to pick out pumpkins. And it was so nice b/c it wasn't 90+ degrees. I mean seriously, what fun is it to pick out pumpkins in that sort of heat? Ick. 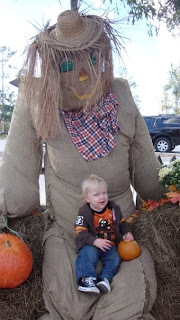 Last weekend we headed to "Park A Boo" at Lafeniere park. My sister was in town with her rug rats, so we all went down and had a good time. They had Barney, SpongeBob and some crazy looking creatures walking about. Noah's favorite thing was the music where he could bust out his moves and shake his money maker (ok, I kid, I kid, his tush!). The kiddos seemed to have a good time and they looked adorable of course. 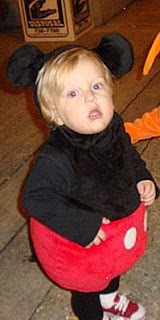 This weekend is Noah's 1st real Halloween (last year he was sick...boo!). I'm excited. Our front yard has 2 blow ups..or BOO'S as Noah says. Plus, some fun pumpkin lights. It's like Clark Griswald himself put up some decorations. I wonder what Clark...err, I mean Clint has in store for Christmas. Stay tuned!! !